Head west towards Uplowman for 0.9 miles. Take the 1st left at Uplowman for 0.8 miles. Sharp right at Higher Town for 0.5 miles. Take the 2nd right for 0.2 miles. Take the 1st left for 0.9 miles. Turn left onto restricted usage road for 0.1 miles. Head west towards Uplowman for 0.9 miles. Turn right at Uplowman for 3.7 miles. Turn left for 272 feet. Destination will be on the left after 0.2 miles. Head west towards Uplowman for 0.9 miles. Continue straight onto Uplowman Road for 0.5 miles. Turn left towards Greenway for 0.9 miles. Continue straight onto Greenway for 0.2 miles. Sharp right onto High St for 0.2 miles. Take the 1st left onto Lower Town for 1.4 miles. Turn left for 0.7 miles. Take the 1st right for 0.7 miles. Turn left. Destination will be on the left after 0.2 miles. Head west towards Uplowman 0.9 miles. Continue straight onto Uplowman Road 1.8 miles. Turn left to stay on Uplowman Road for 0.7 miles. Turn right onto Blundell's Road for 1.2 miles. At the roundabout, take the 2nd exit onto Great Western Way/​A396 for 469 feet. Turn right onto Blundell's Road. Destination will be on the right after 148 feet. Head west towards Uplowman for 0.9 miles. Turn right at Uplowman for 1.0 miles. Turn left 387 feet. Take the 1st left towards Bolham Lane for 3.5 miles. Turn right onto Bolham Lane for 0.7 miles. Turn right onto Rix Cottages/​A396. Destination will be on the left after 367 feet. Head northeast on Whitnage Lane for 0.1 miles. Slight right for 1.2 miles. Turn right for 1.2 miles. At the roundabout, take the 3rd exit onto the A361 ramp to M5 for 0.3 miles. Merge onto A361 for 0.4 miles. At the roundabout, take the 3rd exit onto the M5 ramp to Exeter/​Cullompton/​Honiton for 0.5 miles. Merge onto M5 for 3.6 miles. 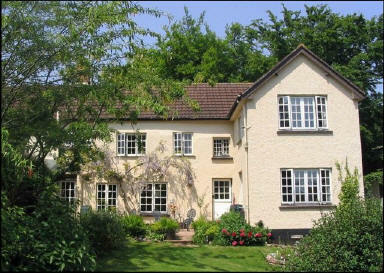 At junction 28, take the A373 exit to Honiton/​Cullompton/​B3181 for 0.2 miles. Turn right onto Honiton Road/​A373. Continue to follow A373 for 269 feet. At the roundabout, take the 2nd exit onto Station Road/​B3181. Go through 2 roundabouts for 0.4 miles. Turn left onto High St/​B3181. Continue to follow B3181 for 0.7 miles. At the roundabout, take the 2nd exit for 0.1 miles. Turn right after 36 feet. Head west towards Uplowman for 0.9 miles. Turn right at Uplowman for 1.0 miles. Turn left after 387 ft. Take the 1st left towards Bolham Lane for 3.5 miles. Turn right onto Bolham Lane for 0.7 miles. Turn right onto Rix Cottages/​A396. Continue to follow A396 for 2.0 miles. Turn left onto Iron Bridge for 0.5 miles. Slight left towards Rackenford for 1.8 miles. Continue straight onto Rackenford Road for 0.3 miles. Turn left. Destination will be on the left after 0.1 miles. Head northeast on Whitnage Lane for 0.1 miles. Slight right for 1.2 miles. Turn left for 279 feet. Take the 1st right for 0.9 miles. Take the 1st right for 0.5 miles. Turn left for 0.7 miles. Turn left towards Longwood Lane for 0.5 miles. Turn right onto Longwood Lane for 1.3 miles. Turn left onto A38 for 2.1 miles. At the roundabout, take the 2nd exit onto Exeter Road for 1.0 miles. Continue onto Mantle St for 0.4 miles. Continue onto Fore St for 0.2 miles. Turn left onto North St/​B3187. Continue to follow B3187 for 0.8 miles. Turn left after 459 feet. Head west towards Uplowman for 0.9 miles. Continue straight onto Uplowman Road for 1.8 miles. Turn left to stay on Uplowman Road for 0.7 miles. Turn right onto Blundell's Road for 1.2 miles. At the roundabout, take the 2nd exit onto Great Western Way/​A396 Continue to follow A396. Go through 2 roundabouts for 0.8 miles. At the roundabout, take the 1st exit onto West Exe S/​A396. Continue to follow A396. Go through 1 roundabout for 3.4 miles. Turn right onto A3072 for 0.2 miles. Slight left. Destination will be on the right after 0.4 miles.